Today, structured light systems are widely used in applications such as robotic assembly, visual inspection, surgery, entertainment, games and digitization of cultural heritage. Current structured light methods are faced with two serious limitations. First, they are unable to cope with scene regions that produce strong highlights due to specular reflection. Second, they cannot recover useful information for regions that lie within shadows. Examples are shown in the above figure - a metal hemisphere (specularities) and a cube (shadows). 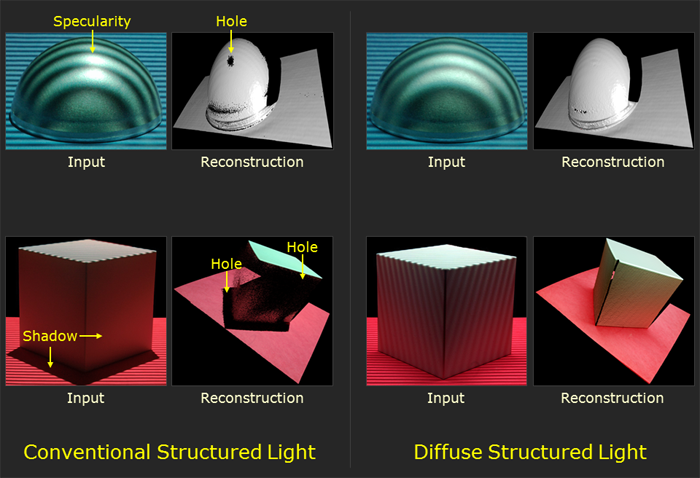 We propose diffuse structured light, a simple but effective approach to mitigate both specularities and shadows in structured light methods. 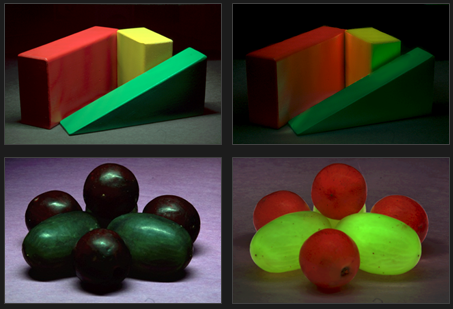 The key observation is that many structured light methods use illumination patterns that have translational symmetry, i.e., two-dimensional patterns that vary only along one of the two dimensions. We show that, for this class of patterns, diffusion of the patterns along the axis of translation can mitigate the adverse effects of specularities and shadows, while maintaining the illumination coding. 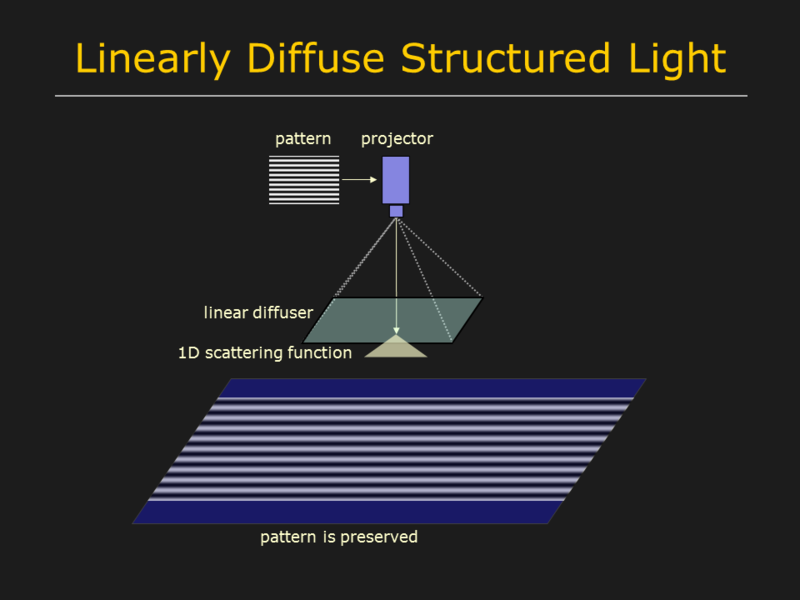 Our approach can be used in several structured light applications; we show results for two - 3D scanning using sinusoidal phase shifting and separation of direct and global components of light transport using high-frequency binary stripes. 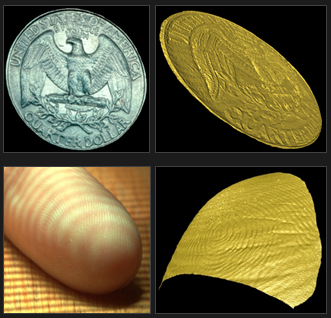 We present 3D scanning results for a variety of scenes which have specularities and shadows. Here, we present results for the separation of direct and global components of light transport. 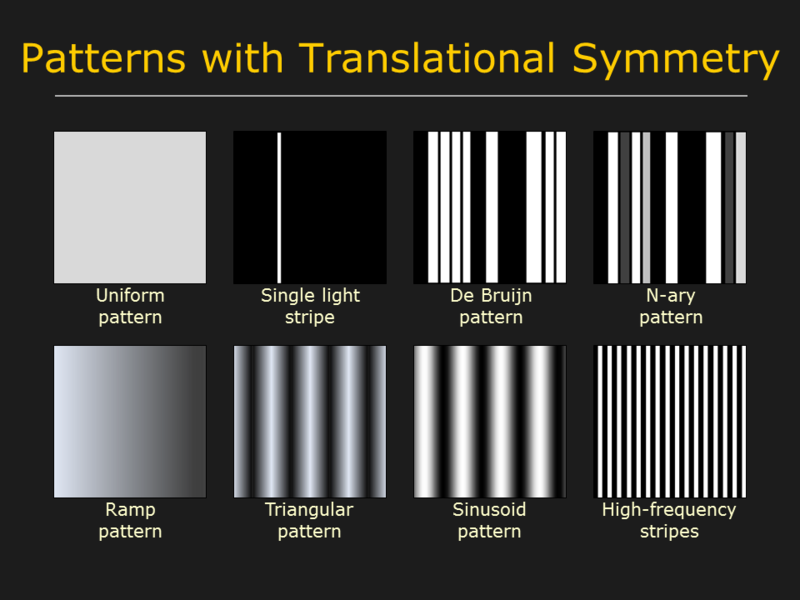 Several structured light patterns have translational symmetry. For this class of patterns, diffusion of the patterns along the axis of translation can mitigate the adverse effects of specularities and shadows, while maintaining the illumination coding. A diffuser placed between the projector and the scene acts as an extended light source, and mitigates specularities and shadows. 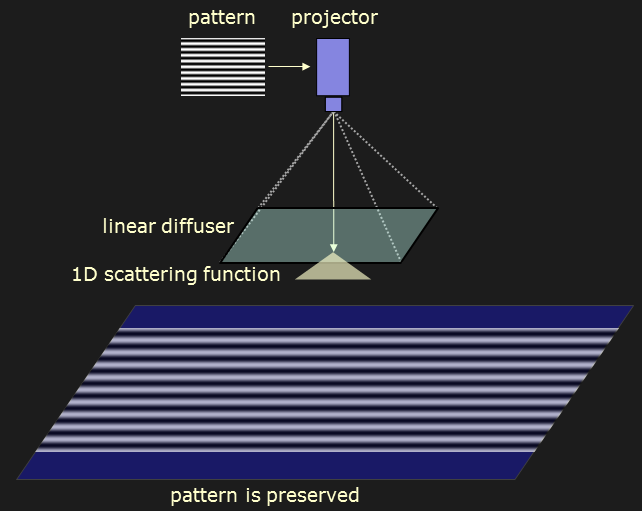 We use a linear diffuser, which scatters light only along one dimension (diffusion axis). If the diffusion axis is aligned along with the pattern's axis of symmetry, then the coding information is preserved. 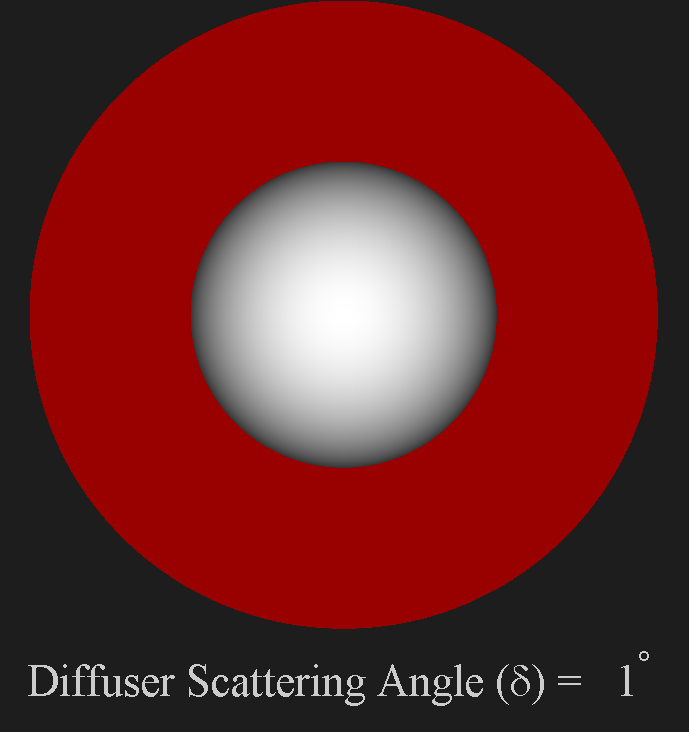 In order to compute the performance gain of diffuse structured light quantitatively, we consider spheres as they have all surface normals. We consider a glossy sphere for specularities and a Lambertian sphere for shadows. Our technique is applicable if the projected patterns have linear iso-intensity contours. 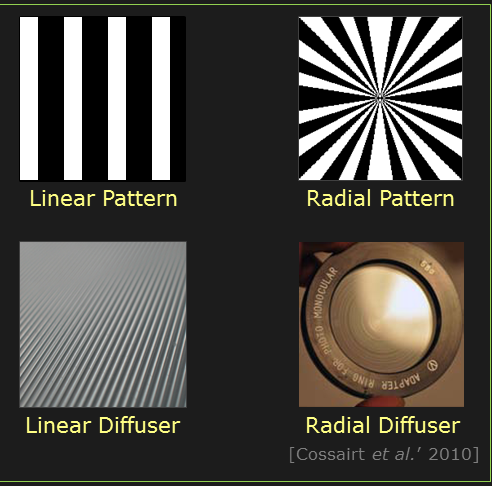 For example, patterns with linear translational symmetry can be used with linear diffusers and patterns with radial symmetry can be used with radial diffusers. In these cases, the illumination coding is preserved. Diffuse SL can not be used if the patterns have non-linear iso-intensity contours. 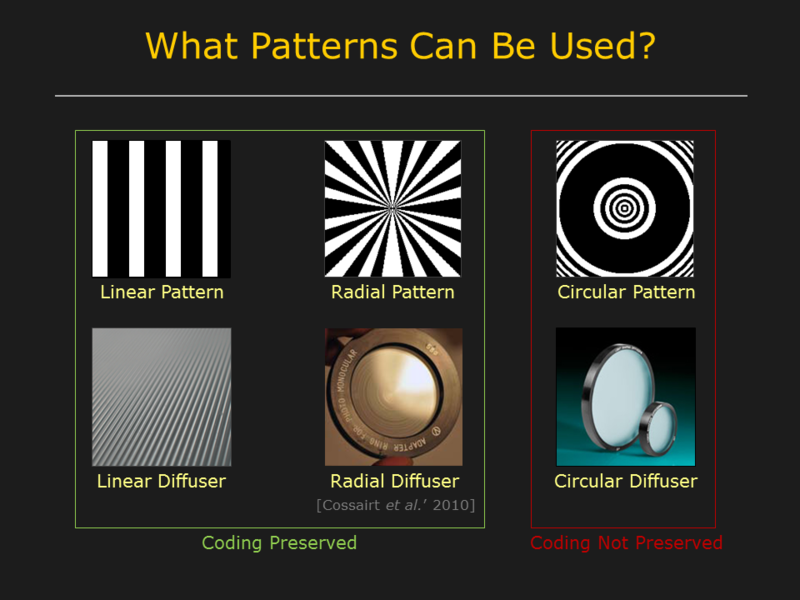 For example, if circular patterns are used with a circular diffuser, coding information will not be preserved.